Tucker Paving was brought on to execute the large public sector job for the Haines City Public Library and City Hall buildings. We efficiently demoed the existing facilities and completed all underground utilities, sightwork, and paving for both the library and the new City Hall simultaneously. The Tucker Paving team was brought on to build a temporary parking lot to reroute traffic while constructing a new parking garage and medical facility. Enabling our clients to best serve their patients, we successfully maintained full access for ambulances and the Emergency Room department during construction and completed all underground utilities and Earthwork two months ahead of schedule. Barnett Learning Center is moving forward. Tucker Paving was chosen as the preferred site contractor for the Haines City Public Health Department which is now complete. The construction of the new Health Clinic in Haines City began towards the end of December 2011 and continued through the middle of 2012. The General Contractor for the project is Peter Brown Construction. Work began on the additional parking lot for Legoland Employee members February 2014. Work includes total site development of storm utilities, pervious material parking spaces, and asphalt drives. Concrete sidewalks and curbing have also been included to complete the site project. Tucker Paving completed the project on time for grand opening. Legoland opened the doors on October 15th, 2011 and what a success. 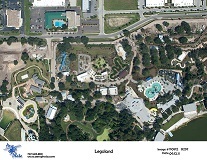 Legoland, located at the Old Cypress Gardens Park, included many types of construction work for TPI which included site clearing, demolition, excavation, underground storm, sewer, potable, and fire line utilities and asphalt paving. Posner Park in Davenport, Florida will soon have a Chrysler, Dodge, and Jeep dealership. The dealership is located on the corner of Minute Maid Ramp Road and Highway 27. We are pleased to have been chosen as the site contractor for this important project. Our scope of work included site utilities, site excavation, building pad, sub base, asphalt paving, and site concrete. Posner Dodge celebrated Grand Opening Day on January 25, 2012.